We have two online companies that allow for custom product orders to be purchased directly through their websites. This not only saves us time, but you don’t have to wait for a minimum order of any one item to order. You can order any time. PrepSportswear is co-branded with Nike, Adidas, Champion, Russell,etc. and have a wide range of high quality items including bags, hats, fleece, etc. You can order silkscreened or embroidered items in the new logo. Both silkscreen and embroidery can be logo colors or all white. Look for those options. They also have a huge range of other popular designs in the school colors. This is primarily a high school site but there are many items available that do not have “high school” on them. There are many customizing options available for the personal “Chrysalis” touch. CaféPress also has our new logo on water bottles, stickers, and other promotional items. 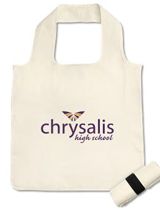 Look for both “Chrysalis High School” and “Chrysalis School” options. Women’s sweatshirt: DT292. Maried embroidered sweatshirt. Runs true to size. Very fitted. Men’s hooded sweatshirt: DT133. Runs big. Buy a size smaller than you normally wear.